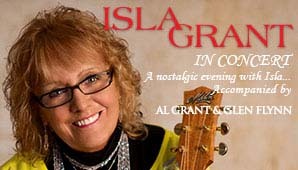 Following her 2015 triumphant sell out performances, Scotland's legendary singer/song writer Isla Grant returns to Australia with exciting new songs - plus her extensive repertoire of her most loved music. Al Grant, Islas’ genial and talented husband will join her on stage and bring his irrepressible humour to the show featuring his tribute to Jim Reeves. Accompanied by the multi-instrumental musician and singer Glen Flynn.